Before A Different World, I had no idea what a Historically Black College or University (HBCU) was. I knew that college was a magical place I was expected to attend, but the show presented an image of all-black college Hillman, and I was smitten. The show sealed it in my mind that this was what proper young black women did. I decided I would go to Spelman College, haven for black girls grown up. The school enthralled me, especially when I discovered that all-male Morehouse was nearby, full of smart, handsome black men. However, I eventually forgot about my zeal for Spelman and for an HBCU education. When it came time for graduation, my college chose me; I was provisionally accepted into the University of South Florida (USF) early on a full ride scholarship. I applied to no other schools. I wound up at Florida State University (FSU) for graduate school because their Graduate Studies program sent me an open house flier in my senior year. (Marketing works, ya’ll!) I visited and was wooed by their fellowships. Again, I applied to no other schools, and they accepted me to the Master’s program in English on a teacher’s assistantship. You haven’t lived until you’ve heard the Marching 100 play. You cannot live in Tallahassee, Florida, without Florida Agricultural and Mechanical University (FAMU) touching you, even if your feet never grace the University that sits on “the highest of seven hills.” Whether you hear the Marching 100 as you drive down Macomb Street, or the hiss of a Rattler in the middle of Publix, you know that Tallahassee belongs to FAMU as much as it belongs to FSU. I was asked often why I chose FSU over FAMU and the honest answer is that I never thought about it as an either/or option. FSU advertised and I bit. Even though I never took a class there, FAMU adopted me. I performed poetry at their State of the Student address; I went on a date to see Alvin Ailey’s troupe dance; I saw Elaine Brown speak; I enjoyed a blue crab and corn on the cob boil on their lawn; I dropped off freshmen to Paddyfote dorms in the dark. FAMU gifted me with the black cultural experience that FSU could not. Last weekend, FAMU’s football team played Ohio State in a mockery of a game that netted the HBCU $900,000.00 and immeasurably lost pride. The 76-0 loss set records. Football serves as an ambassador for the University; to the millions of Americans who have never beheld the glory of orange and green, this was a shoddy introduction. FAMU was made to look like a bumpkin of a school for the sake of nearly a million dollars–which it needs–but a great image would garner far more income. But why would FAMU so need the money? Because the school, like many HBCUs, struggles with alumni giving. A confluence of racial politics dating back to the ’60s, graduate dissatisfaction, the new economy, and poor administration are all to blame. 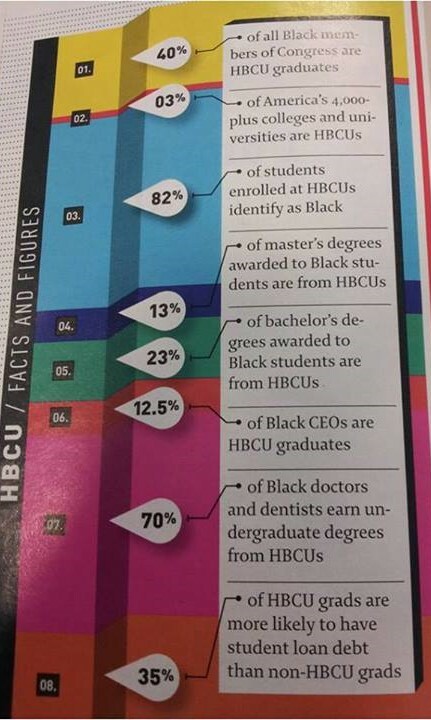 Despite the above challenges, HBCUs still crank out more black graduates in STEM than Predominately White Institutions. Half of the nation’s black teachers, lawyers and judges are HBCU grads. My husband will be an HBCU graduate. My closest friends are FAMUly. Many people lob the asinine question: Does America still need HBCUs? The answer is a resounding yes. I am adopting FAMU as my HBCU. I pledge my support financially. I will give my verbal support, defend the school from spurious attacks as any rightful Rattler would, and challenge its leaders to do right by the alumni and future students. I repeat, the apt question is not whether HBCUs should still exist. The real question is: How will we ensure that they do? Elaine Brown is pretty amazing. As an HBCU grad I applaud your dedication to FAMU. I give every year to my alma mater, even when it hurts a bit. I wish more people would, since as you noted many HBCUs are struggling financially. If I ever become wealthy I’d love to give a huge some to whichever HBCU was struggling the most.